I know today suppose to be a “Try it on Tuesday” day but, with my task list, it just isn’t going to happen. About two month ago, Kelli told me she wanted to make a quilt for Jason’s sister for Christmas. I was fine with that but told her and told her not to rush me with the quilting and to get the quilt to me by about Thanksgiving time..well that got pushed back and pushed back so now I am rushing to get it done. She got the quilt to me on Saturday. We’ve had extra people here since Friday so I haven’t really had time to get to it. Yesterday everyone was off doing other things at about noon. I started on the quilt. I really didn’t have a specific design in mind and before I knew it the quilt was talking and I was trying to listen…. I did everything I could to keep me in the quilting room. Hubby checked on me…Karl checked on me then after a bit our son Karl asked if I minded if he made tacos for supper. Nope..I didn’t mind. I knew I had to stay at this quilt. I came down and grabbed a bite to eat and was right back at it. I came downstairs at 9:20 pm with quilt in hand. I love the look of pebble quilting. The fabric line is Moda’s Hubba Hubba. Cute right?? 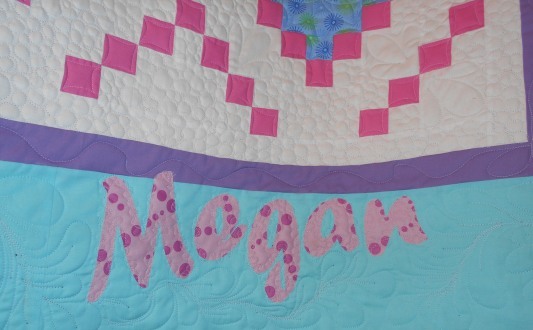 We put Megan’s name in the border too. All in all I am happy with the quilting. I put feathers on the outside border that look okay for my first real attempt at them. In a perfect world or if I was a professional machine quilter, I think I needed to play with the tension a little more. Once in a while when doing the feathers a purple thread from the back showed on the front. Stop back-hopefully on Friday and this will have a binding. I designed the quilt and Kelli intends on having some instructions written. 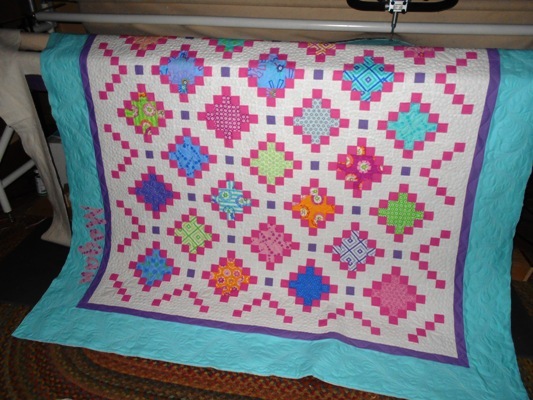 The quilting is finished and now I’m onto my own list of things I need to have done…. 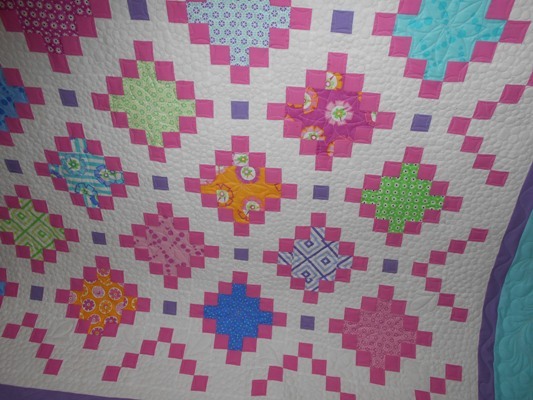 This entry was posted in Family, Quilting on December 24, 2013 by Jo. I love the quilt and the quilting. before you mess with the tension try turning up the speed of your machine. it might just be that you are moving faster that the machine is stitching bring that you are rushing. Beautiful quilt, Kelli! And I love the quilting, Jo! It looks super! I’m sure she will love it! Merry Christmas and Happy New Year to you and your whole family! Good Job! all the way around…..pattern, quilting and fabric choices! Perfect! Way to stick with it. I love the quilting you did on it. The pattern is great for those fabrics. Great quilt! Merry Christmas to you and yours. Everything about this quilt is wonderful. Isn’t it fun when a quilt speaks to you and you get it just right! I love your quilting design. I hope someday my quilts will speak to me too. 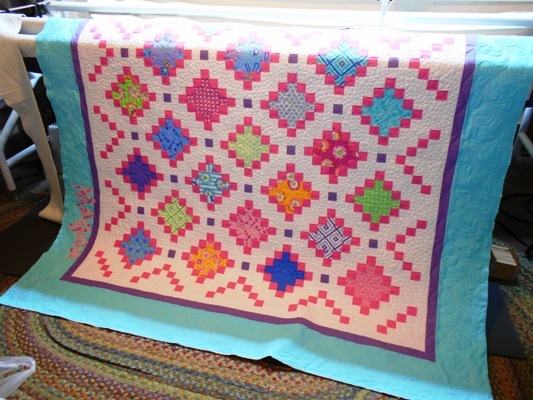 A beautiful quilt with such pretty colours…and the quilting gives so much texture…yum! What a beautiful quilt! I really, really love it! OH I LOVE IT! the colors really are fabulous! I can see a little girl (or bigger girl) would love it. Bless you for getting that done. 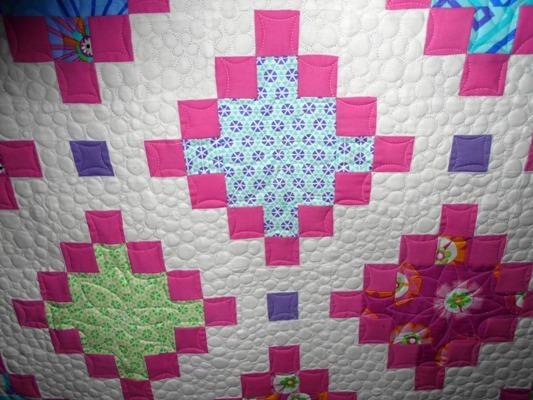 Its a lovely design and a beautiful quilt. Think how happy the receiver will be. It’s a beautiful quilt! Nice job on the quilting. Fabulous job and love the pattern. It is great.